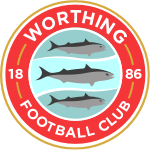 Worthing lost Danny Barker and David Ajiboye to injury along with the returning Joel Colbran to a straight red card, all in the first half, as they fell in the final qualifying round of The FA Trophy. 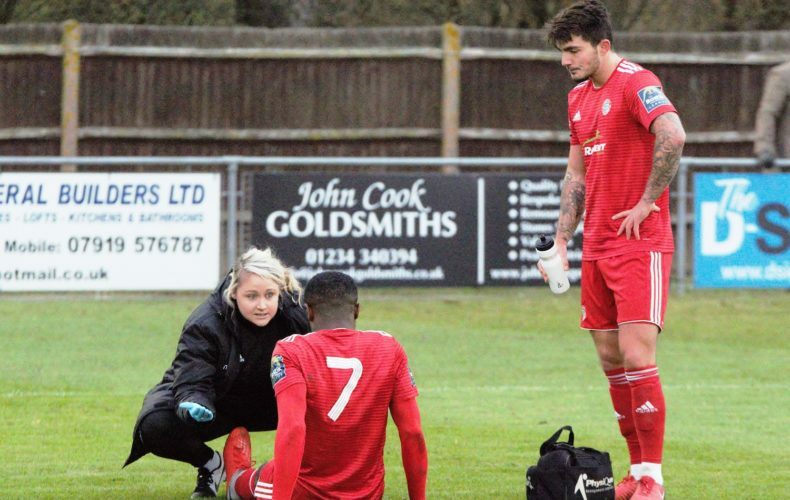 Changes to Tuesday’s epic penalty shootout win against Tonbridge were inevitable, as Parsons was suspended, while Reece and Zack were “ cup-tied “. So, Joel Colbran came back in to the starting eleven, as did Barker, Ajiboye, Clarke and Starkey, which left Ovenden and Rance to take their places in the dugout. It was the fit again Colbran, who drew the foul from Dan Walker, that lead to Joe Clarke just failing to get on the end of Sam Rent’s free-kick, as he threw himself at a right-sided delivery heading towards the back post. Two minutes later and David Ajiboye powered his way down the centre of the pitch, finding Callum Kealy, who’s shot tested the early reflexes of Niall Cooper in the home goal. Approaching the quarter-hour mark and Bedford had a chance to open the scoring but, after Jordan Jarrold had slipped him in, Paul Benson couldn’t quite get the ball under control and the game remained goalless. Joel Gyasi fired a low, ambitious effort wide, while Will Miles was kept busy by heading away three times from balls into the box, either side of Gyasi’s drive. Midway through the opening period, Jesse Starkey’s touch took him away from his marker inside the area, only for his subsequent shot to fly over the crossbar. Meanwhile, at the other end, Clarke had to be alert to head away a dangerous-looking left wing cross, as both teams took the game to each other. 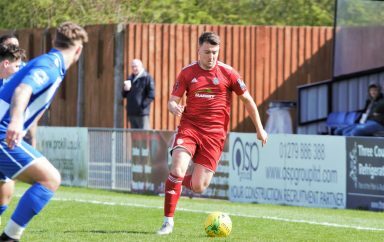 Rents had a second set-piece that failed to trouble the ‘keeper and Benson won a tussle with James Crane that saw the frontman draw Kleton into making his first real save of the day. Then, a precise pass in, from the inside right channel, by Ricky Aguiar, was latched onto by substitute, Jazz Rance and he lifted the ball over Cooper with his first touch before bundling it in with his second. The advantage was almost short-lived though, as Benson missed Gyasi’s low fizzer by millimetres and the pair nearly combined to deadly effect again moments later but, the visitors defended stoutly to preserve their precious lead. Starkey and Walker traded chances, shortly before the break. The former firing over the bar after a neat one-two between himself and Kealy, the latter doing so once he’d cut inside. Stoppage time produced a further attempt by Rance but more significantly, a red card for a two-footed challenge by Colbran on Mason Watkins-Clark, right in front of the referee. 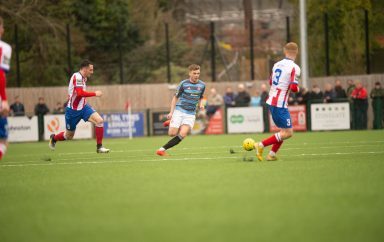 Despite being down to ten men, the side from Sussex created the first opportunity of the second period, when a James Peters header fell invitingly for Aguiar, who turned his man but placed his effort wide of the near post. Rance drifted in from the right flank and, from his blocked shot, Kealy could only find the safe hands of Cooper. A long ball from the back by The Eagles lead singer, sorry, I mean Captain, Gavin Hoyte, picked out Walker but KP was out quickly to stop the lurking Benson from capitalising, with Gyasi’s follow-up hurtling towards the A603. A cross-shot from Rents narrowly missed the far post, while Ashton Grant went further away from the upright and Walker should have done better, once he’d beaten Clarke but instead, opted to – unsuccessfully – pass to Benson and the chance went begging. Aguiar stung the palms of Cooper, just a few short minutes before Bedford made their numerical advantage count. Cade Stephens sent over an inch-perfect cross towards the far stick, for Benson to head back and down to Walker, who took advantage of the room afforded to him, as he controlled with his right foot and finished high into the net with his left, from close-range. With barely time to recover, Worthing soon found themselves behind. A free-kick deep inside the host’s half set Ben Ford racing away over the halfway line and, after a one-two with Walker, he had time and space to get in a cross that saw Benson rise above Crane and head home the winner. As time slowly ebbed away, Rance suffered the misfortune of miskicking on the edge of the ‘D’, before a foul on Aguiar offered Rents the chance to salvage a replay. His floated delivery, however, was met by the head of Miles and, gut-wrenchingly, the gloves of Cooper. The sight of several players laying flaked-out on the floor at the end of the game, said it all. A brave effort but, ultimately, it wasn’t to be our day.